334 pages | 5 B/W Illus. 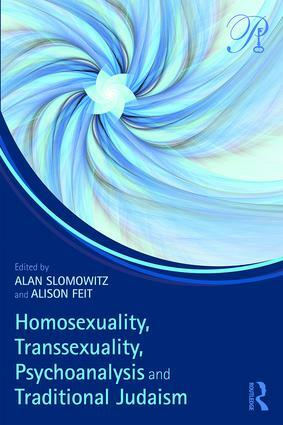 Homosexuality, Transsexuality, Psychoanalysis and Traditional Judaism explores the often incommensurable and irreconcilable beliefs and understandings of sexuality and gender in the Orthodox Jewish community from psychoanalytic, rabbinic, feminist, and queer perspectives. The book explores how seemingly irreconcilable differences might be resolved. The book is divided into two separate but related sections. The first highlights the divide between the psychoanalytic, academic, and traditional Orthodox Jewish perspectives on sexual identity and orientation, and the acute psychic and social challenges faced by gay and lesbian members of the Orthodox Jewish world. The contributors ask us to engage with them in a dialogue that allows for authentic conversation. The second section focuses on gender identity, especially as experienced by the Orthodox transgender members of the community. It also highlights the divide between theories that see gender as fluid and traditional Judaism that sees gender as strictly binary. The contributors write about their views and experiences from both sides of the divide. They ask us to engage in true authentic dialogue about these complex and crucial emotional and religious challenges. Homosexuality, Transsexuality, Psychoanalysis and Traditional Judaism will be of great interest to psychoanalysts and psychoanalytic psychotherapists as well as members and leaders of Jewish communities working with LGBTQ issues. Alan Slomowitz, Ph.D., is a supervisor of psychotherapy and on the faculty at the William Alanson White Institute. He is on the Editorial Board of Contemporary Psychoanalysis, and an internet editor of the Contemporary Psychoanalysis in Action blog. He edited Interpersonal Psychoanalysis and the Enigma of Consciousness (2018) by Edgar Levenson and the new Routledge release of Levenson’s book The Purloined Self (2016). He is in private practice in psychoanalysis and psychotherapy in New York City, USA. Alison Feit, Ph.D., teaches at Stony Brook University, St. Louis Psychoanalytic Institute, and at the China American Psychoanalytic Alliance. She is an associate editor of the journal Contemporary Psychoanalysis and a member of the Artist Group, the Sexual Abuse Service, and the Trauma Service at the William Alanson White Institute in New York. She maintains a private practice in Manhattan, New York City, USA.